Received 10 December 2009; accepted 16 May 2010. Available online 24 May 2010. 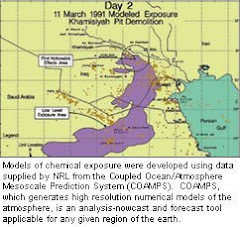 Potentially more than 100,000 US troops may have been exposed to the organophosphate chemical warfare agents sarin (GB) and cyclosarin (GF) when a munitions dump at Khamisiyah, Iraq was destroyed during the Gulf War (GW) in 1991. Although little is known about the long-term neurobehavioral or neurophysiological effects of low-dose exposure to GB/GF in humans, recent studies of GW veterans from the Devens Cohort suggest decrements in certain cognitive domains and atrophy in brain white matter occur individuals with higher estimated levels of presumed GB/GF exposure. The goal of the current study is to determine the generalizability of these findings in another cohort of GW veterans with suspected GB/GF exposure. 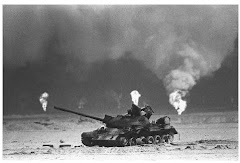 Neurobehavioral and imaging data collected in a study on Gulf War Illness between 2002 and 2007 were used in this study. We focused on the data of 40 GW-deployed veterans categorized as having been exposed to GB/GF at Khamisiyah, Iraq and 40 matched controls. Magnetic resonance images (MRI) of the brain were analyzed using automated and semi-automated image processing techniques that produced volumetric measurements of gray matter (GM), white matter (WM), cerebrospinal fluid (CSF) and hippocampus. GW veterans with suspected GB/GF exposure had reduced total GM and hippocampal volumes compared to their unexposed peers (p ≤ 0.01). Although there were no group differences in measures of cognitive function or total WM volume, there were significant, positive correlations between total WM volume and measures of executive function and visuospatial abilities in veterans with suspected GB/GF exposure. These findings suggest that low-level exposure to GB/GF can have deleterious effects on brain structure and brain function more than decade later.